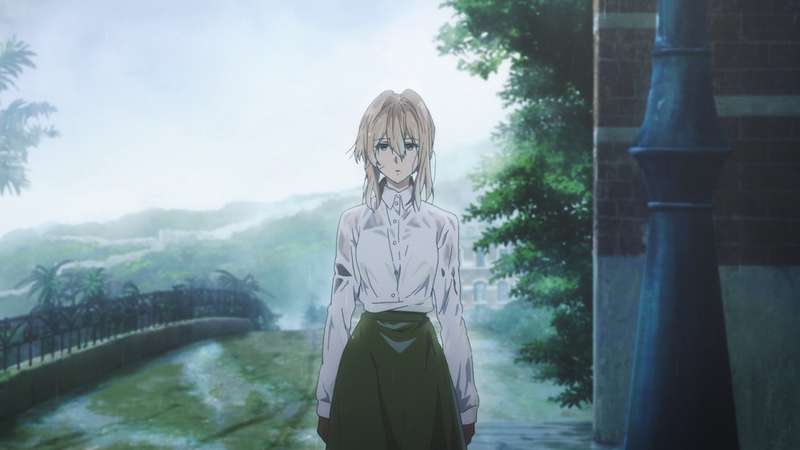 Ever since it first aired in Japan in January 2018 and subsequently worldwide on Netflix in April, Violet Evergarden has mesmerized audiences all over the world with its beautiful visuals and moved many hearts with the stories it depicted. Here, we will talk about the series with director Ishidate Taichi and series director* Fujita Haruka. Q. So, before we begin with the technical side of Violet Evergarden’s production, can you tell us what your thoughts are after reading the original novel by Kana Akatsuki for the first time? Ishidate: It had me in tears right from the very beginning. The first chapter of the novel is “The Novelist and the Auto Memory Doll”, which covers the episode between Oscar and Violet, and it made me cry from the get go. Since the novel was written in an omnibus format, it made me want to keep on reading. Fujita: The Violet in the novel was the kind of girl who can already handle her job in a professional manner. But even so, she wasn’t perfect—she was missing something, and that made her a very interesting character. After reading through the book and seeing how Violet was like in it, I thought, well, when I adapt this into an anime, I want to show her starting out with that imperfect state and gradually overcoming it. Q. After reading the novel, what kind of girl do you think Violet is? Fujita: When we were talking about that with the rest of the staff, we came to the conclusion that she’s like a prism. Ishidate: Yes, we did discuss that. A prism splits a single ray of light into 7 different colors, right? When the other characters passed their thoughts and feelings through Violet, they underwent changes—perhaps their beliefs changed, maybe they found salvation, or they began to look at the world a little differently… So we thought she’s quite like a prism in that way. Also, just like what Fujita had said earlier, due to her “imperfection”, she has the ability to say and do things other people might consider taboo. That’s another unique characteristic of hers. Fujita: After reading the novel, I thought that even if Violet is a girl who may look a little scatterbrained and careless at first, she’s a prism who can help her clients as well as the people around her, and I paid a lot of attention to portraying her growth through the episodes. How Do You Depict Violet? Q. I see, so you placed a lot of importance on portraying Violet’s growth in the anime. Speaking of which, the order in which the events unfold in the anime are quite different from the sequence in the novel. Did you have a lot of trouble when restructuring the story? Ishidate: Oh yes, we had a lot of trouble with that. The novel’s compiled like a collection of short stories, so the timeline is quite jumbled. 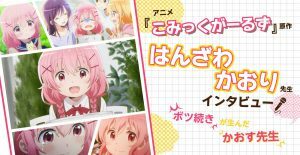 But since our primary focus for the anime is “depicting Violet’s growth”, we rearranged the events to play out in a linear order. We thought it would be easier for the audience to feel how much she had developed this way. But when we were rearranging the scenes, we also ran into the problem of deciding where we’d put the scenes where Violet breaks down in tears… Actually, we were also on the fence about whether we should have her cry or not to begin with. This was something we deliberated on until the very end. Ultimately though, we decided to let her cry. Maybe it’s some sort of parental affection, but we wanted her to mature into a proper adult. From a parent’s point of view, watching your child grow up can be both a joyful and saddening experience, but you’d still want them to mature into independent adults who can take care of themselves. So to show how Violet matured into someone like that, we arranged the episodes in a way that would show how she gradually became able to show and understand human emotions. Come to think of it, Violet’s feelings did show more clearly and more beautifully in visual form. Ishidate: I thought that it wouldn’t be a good idea to depict the crying scenes too beautifully. When Violet found out about Gilbert’s death in episode 9, her tears were a manifestation of the sense of loss resulting from that painful discovery, so I made it a point to not portray her tears too prettily when directing the scene. We also had trouble deciding the direction for the crying scene in episode 10 (”A Loved One Will Always Watch Over You”). Ogawa handled the storyboard for that episode. At that point in the story, Violet can already understand human emotions pretty well—she could say things like “I felt like crying from the very beginning”. Since it was just right before the last leg of the story, Ogawa came to us wondering if it’s alright to make Violet cry that much at that point, and while we weighed our choices for a while, we ultimately went with letting her cry. It was that parental affection again, and while setting the direction for that scene, we came to feel like we wanted to tell her that it’s alright to cry as much as she wanted. So we decided to set a scene where Violet wept as the other dolls watched over her at the end of episode 10. So Violet was unable to stop her tears because she may have instinctively felt that after losing Gilbert, the CH Postal Company, where all the other dolls she worked with is her new home. It seems that a lot of fans have been moved to tears themselves at seeing her cry. Q. Seeing that Violet is that kind of character, “how Violet will be voiced” is definitely something that we’re all very curious about since before the anime aired. 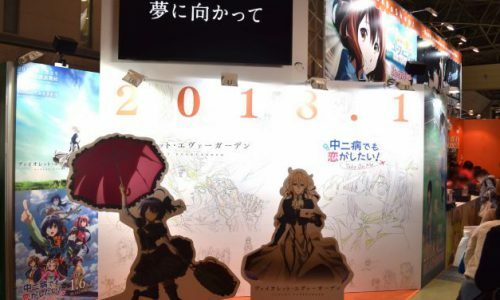 I’m sure there are lots of fans, both of the original novel and the anime, who were really looking forward to what that performance is going to be like. There was a lot of anticipation—how far will the performance go with depicting the emotions? Conversely, how much of it would be held back? What sorts of directions did you, the director, give to Yui Ishikawa (Violet’s voice actor)? Ishidate: When thinking of how to direct Violet, it boiled down to asking ourselves, “What kind of person is Violet?” The conclusion we came to was that it’s not that she doesn’t have feelings, she simply doesn’t understand them. Violet herself expresses that in a line which went, “I don’t understand ‘Love’”. This shows that she isn’t a robot that doesn’t have emotions; she simply hasn’t been taught about emotions by anyone yet, and is purely starting from zero in that respect. That was what I told Ishikawa, and she herself has expressed that in performing as Violet, instead of going for an emotionless or a flat, robot-like feel, she would be able to express Violet’s character better by being her natural self. It’s a sort of a “naive girl” kind of image. With that as a starting point, Violet begins to understand more about the world and grows as a person—this growth is what Ishikawa did her best in bringing out in her performance. I see. In fact, in episode 7, the scene where Violet was distressed when facing her own past, we could really feel the “purity” in her voice. We really cried from the passionate performances done by the cast. 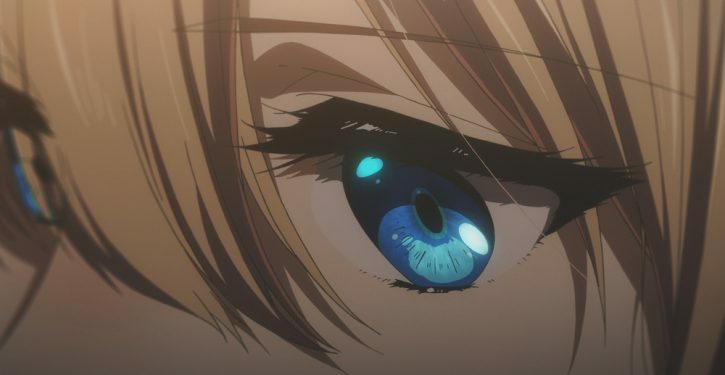 Additionally, there are many scenes in this title where the characters were captivated by the beauty of Violet’s eyes. In this way, the charm of Fujita’s direction has brought a sense of life to the title. Some of the fans have probably gotten charmed by the portrayal of those eyes as well. Fujita: I’ve definitely drawn a lot of Violet from a direct frontal angle in this work. I’ve intentionally included lots of shots of Violet from the front even in the storyboarding stage. Ishidate: That’s right. Normally, the story would advance by switching between the viewpoints of characters. But in the case of Violet, we’ve decided right from the start that we would not use Violet’s perspective as much as possible. Instead, we included lots of scenes where Violet is looking at the camera. Violet from Iris’ perspective… Violet from Luculia’s perspective… Now that I think about it, there really is a lot of scenes where we “look at” Violet. Ishidate: When I read the original novel, I had the feeling that the author, Kana Akatsuki, was really consciously writing about whose perspective we are looking at Violet from. So I’ve also dedicated myself to depicting it as objectively as possible. However, as the story progressed into the later stages, Violet begins to gain a sense of self and as that happens, we also begun adding more scenes told from Violet’s perspective. From around episodes 10 to 13, a lot of cuts using Violet’s point of view were added in. We were aiming to make viewers feel Violet’s “emotions” as her sense of self grows. To be honest, I didn’t notice the “objective depiction”. But now that you mention it… I want to watch the whole series again on the Blu-ray! 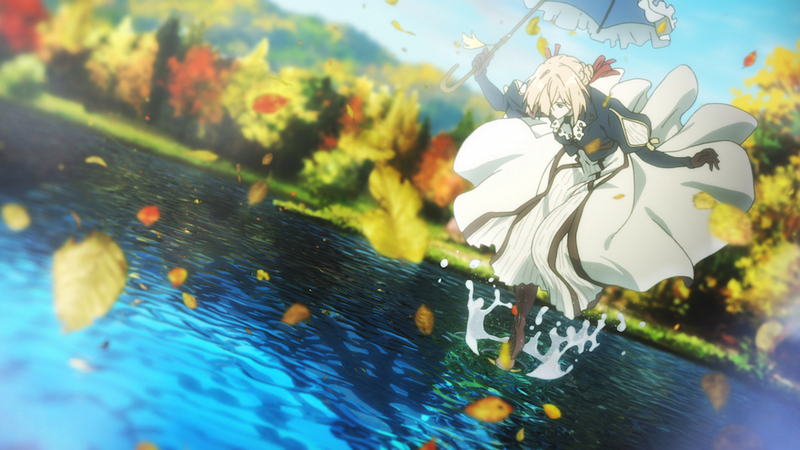 One of the points that catches the most attention in this work is the setting of Violet Evergarden. I noticed that there was even a specific post in the credits for the “world setting” done by Takaaki Suzuki. You must have faced a lot of challenges and put a lot of work into the many details in the setting. Ishidate: Research for the setting of this title was the part that I agonised over the most. I think that even if everyone went and read the original novel, their visualization of the time period and country it’s set in would differ quite a lot from person to person. Once, I asked some of the staff who’d read the novel: “If there’s a bar in Violet’s world, what sort of bar do you think it would be like?” The answer I got from one staff was: “One that has barrels for chairs…?” I thought, is this an RPG game? (Laughs) Another member asked, “I guess it’s (technologically advanced enough that it’s) got beer servers?” Yet another replied, “Umm, I don’t really know…” However, with adapting the novel into an anime, even if it’s just an assumption, we have to come up with and decide on a solid setting. So our first problem was having to decide what kind of a world it should be. That was where we called on Mr. Suzuki to help with making the “world setting” for Violet. Q. By the way, was there a clear image of the country, time period and such? Ishidate: First, we found that the general image that everyone who read the novel got was that it’s set in a European region. But after that, we ran into another problem. Should we make it a greyish world, like the foggy London in the Sherlock Holmes series? That is of course not a bad idea, but for a girl like Violet, who is living in the past, the image of a foggy London is simply too compatible with her. We wanted to bring out a sense of incongruity. Even if it’s set in the same European region, having her standing isolated in a warmer, more vivid world would make it feel like she’s out of place, making her stand out in a good way. So in the end, we decided on Italy! (Laughs) Which is why there are many cuts with palm trees throughout the work. Q. So I see you’ve brought out the sense of contradiction in a good way by making good use of the “beautiful backgrounds” that is one of the main characteristics of KyoAni’s works. Am I right to believe that the backgrounds have been documented in detail in the official fan book, “Violet Evergarden Chronicle”? Ishidate: Exactly what does work on the “world setting” entail, and what kind of a town, Leidenschaftlich, the setting of the title, is—all of that are carefully chronicled in detail. So we would very much like it if fans would give it a read. Q. You had the songs ‘Sincerely’ performed by True and ‘Michishirube’ performed by Minori Chihara created specifically for Violet Evergarden. What did you as the director have in mind before having them composed? Ishidate: First, I didn’t want to go into this asking the composers to include certain specifics or anything like that. I just told them, “I think that the show will have this kind of atmosphere, so I’d like to request you write music suited to that.” When they were completed, I had these two songs and was shocked at how well the lyrics of both the opening and ending theme songs worked with the anime. I actually requested the songs before we had even started working on the last episode, but when I went back to listen to the songs after the broadcast of the final episode, I was really moved by them. I thought, ”I guess that’s what it is…”. The theme song “Michishirube” was fantastic and the way you incorporated it into the end of the episodes was exquisite. *Dubbing: The process in Anime Production where the voice and sound design are finely tuned to the animation. It really is as Mr. Tsuruoka says, both the OP theme song and the ED theme song were impactful and left a deep impression. While we’re on the subject, I’d like to take this chance to talk about the insert song ‘Violet Snow’ that so many fans had been dying to hear in the anime. With its inclusion you really have exceeded our expectations. Ishidate: Honestly, I only intended to use the song to promote the light novel, but the response that it got from fans really exceeded my expectations. Fujita: Even we had the impression that ‘Violet Snow’ was no more than promotional material for the source material. Of course we did have many people on staff who adored ‘Violet Snow’, but I’m really thankful that we had so many fans who also loved the song. Q. 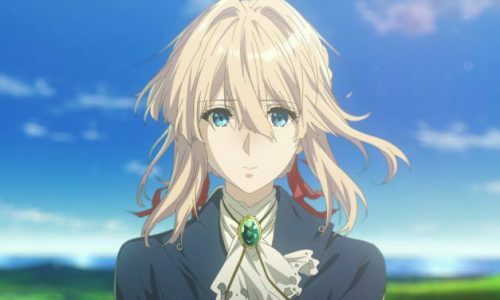 Although the broadcast of Violet Evergarden itself has ended, fans can still enjoy the anime. 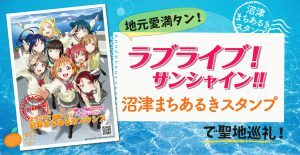 Specifically, we have heard that a special Extra Episode is included in Volume 4 of the Blu-ray and DVD. What can you tell us about the plot of this extra episode? 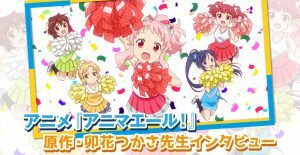 Ishidate: In terms of the show’s timeline, it is a story between the 4th episode and the 5th episode. As mentioned in episode 5, Princess Charlotte says “Wow, you’re really good at writing love letters”, which means Violet went through some extraordinary growth between episodes 4 and 5. The Extra Episode depicts a story that takes place during that time frame. The story is about a singer of an opera house, Irma, who sends a request to the C.H. Postal Company, where Violet works, for someone to pen the lyrics for her song. Q. So it’s an episode where we can see how Violet grows enough to be calm and collected when working on the request of Princess Charlotte. Are there any highlights? Ishidate: I’d like everyone to watch the entire episode with their own eyes, but I definitely would like you to pay attention to what Violet and Irma have in common. Since the setting of this episode is an opera house, it sounds like we’ll really be able to enjoy the world and music. Ishidate: That’s right. We really put a lot of work into the sound design and music, so I hope you’ll be looking forward to that. Q. That reminds me, there will be staff discussion and commentary bundled with the first run of the Blu-ray and DVDs, is that right? What can we expect from this? 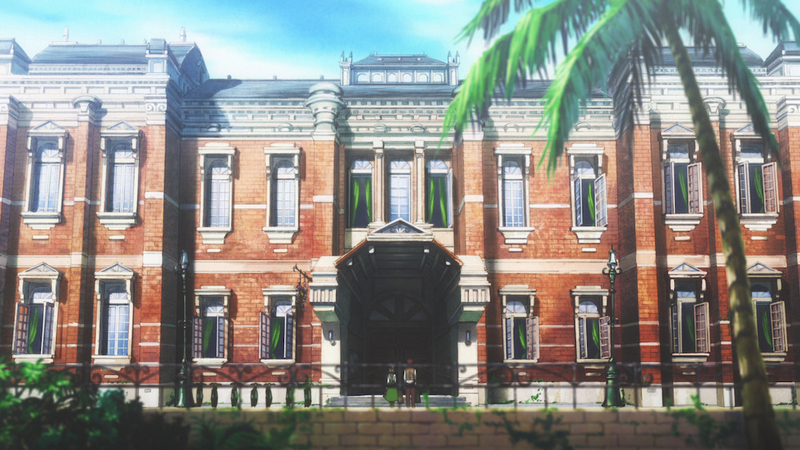 Ishidate: Basically, Fujita will be asking the production staff for their stories in a round-table style discussion. Fujita: This time I was involved closely as a series director, but there are still a lot of things I don’t know about. My seniors have been through much more than me and I was able to hear about their experiences, how they go about doing their work, and much more. I really think that the fans will be able to learn about what it’s like for those of us on the inside of anime studios. Personally, I learned a lot about how to face my work when I work on a story. Q. 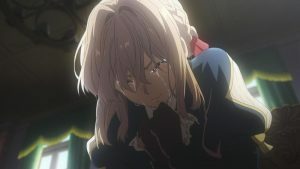 So, all 13 episodes of Violet Evergarden has finished airing now. What do you think about it? 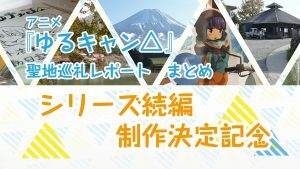 Ishidate: I think we tried hard to make what we wanted to make. We were really vexed about how to present the world concept that is written by so many words in the novel into video form. Were were stuck on how to decide on “display cuts”; I mean, it was extremely difficult to decide on how much time should be allocated to describe each scene. In the case of films, a scene is pretty long, so every scene is presented by display cuts instead of using narration. Therefore, we realized that we should take the production of this anime as though we were making a movie. I think we dealt pretty well with the essential factor of visualization while adapting the original novel into the anime. To maintain such beautiful visuals from start to finish—this is truly what we call “KyoAni quality” animation. Ishidate: Though I don’t think that this is something only our company can do, the most important point that made it possible to produce Violet is the studio environment where we can share our opinions freely and in detail as we worked on it. Q. So Violet Evergarden is made by a united staff. We should really pay close attention and make sure not to miss a single scene in it. So, to wrap it up—do you have something to say to your fans and readers? 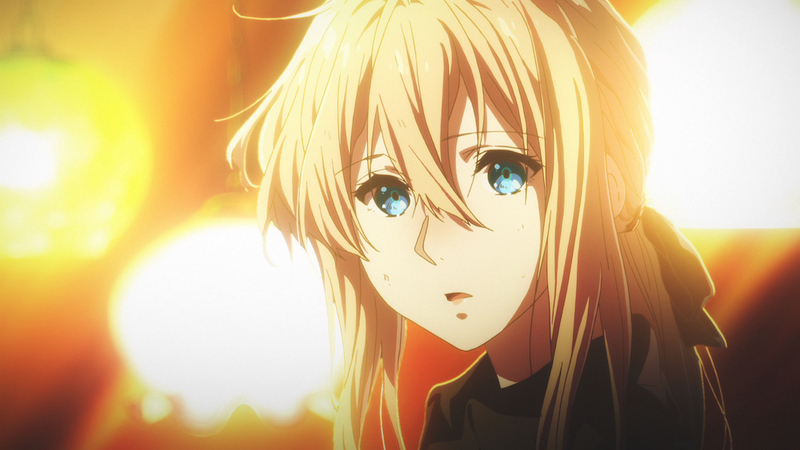 Ishidate: The staff faced this series about a girl called Violet Evergarden head on with unity and sincerity. Since TV animation is a different media from the original novel, there will be some differences between them, but instead of worrying about that, we would be happy if the audience would watch over Violet’s growth right till the very end. Fujita: Through the use of many episodes, we’ve carefully presented the growth of Violet’s heart. 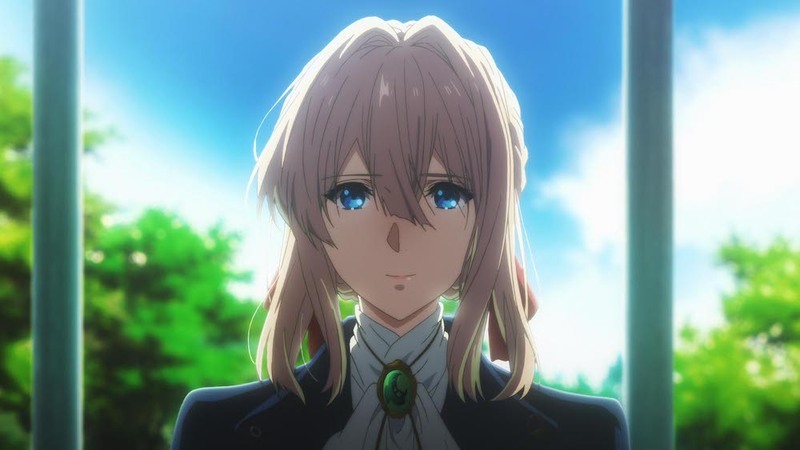 We hope that people who watched Violet Evergarden could also face their heart and cherish their feelings like Violet did. I will be very glad if people feel even a little better after they’ve watched this series. Details about the world setting are included in this book. Violet Evergarden fans should not miss this one! -Vol.1 NOW ON SALE ! -Vol.2 NOW ON SALE ! The Extra Episode is included in Vol.4. What happened between episode 4 and episode 5? Please check it out! In the special edition of all the volumes, there are lots of special gifts and audio commentary by the staff and cast. Don’t miss it! Once upon a time, in an unknown land—the Great War finally came to an end after long years of conflict, and the world slowly began to flourish again. 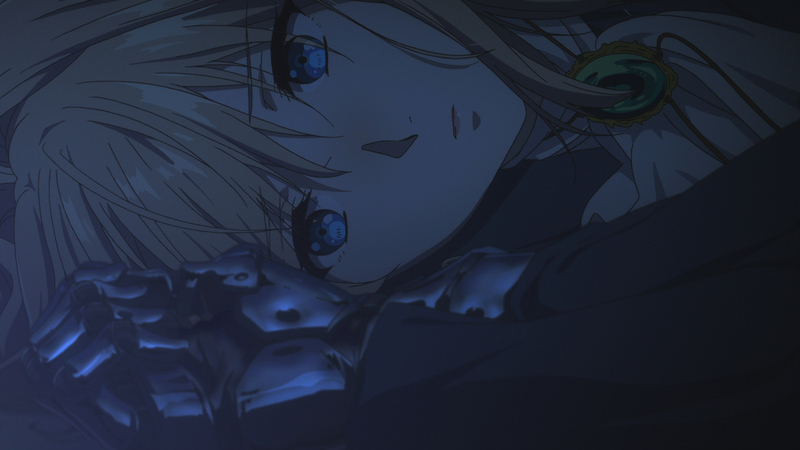 Violet Evergarden, a young girl raised as a soldier, was left with nothing but a few words from the person she had held most dearly, but with no understanding of their meaning. Leaving the military after the war, she arrived in a huge port town, which was full of spirit. The town was full of life, and trams criss-crossed the streets lined with gas lights. It was in this town that Violet began a new life as an “Auto Memory Doll”, whose job was to transcribe people’s thoughts into words on paper.